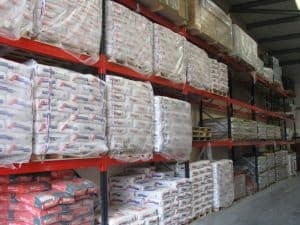 London based builders merchants Hitchcock & King have been supplying timber and building materials to the trade for over 40 years. Their winning formula is based on four key principles – stock availability, price competitiveness, fast delivery and customer service. Hitchcock & King have several branches servicing the London area and a customer base ranging from small builders to large developers as well as housing associations, schools and hotels. Stakapal were required to provide a storage solution for their Twickenham site that would not only fully maximise the area but deliver 100% accessibility, selectivity and stock rotation ensuring an extremely cost effective operation all round. Stakapal’s knowledge and expertise of the builders merchants industry means that as a business we are fully conversant in supplying systems that deliver products with the durability and flexibility that a builders merchant environment dictates. 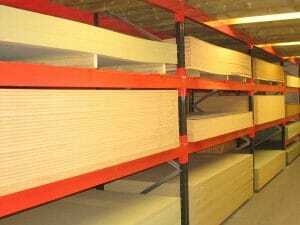 For this particular location Stakapal were asked to supply conventional adjustable Pallet Racking to store standard UK 1 tonne pallets as well as plasterboard storage integrated to accommodate the customers existing bespoke mezzanine floor. This enabled maximum utilisation of the height of the building and also provided additional storage and merchandising space. With Hitchcock & King renowned for their expansive range of timber and joinery products, Stakapal installed two double sided runs of of Integrated Vertical Storage 4.3 metres high with bay spans of 2700 mm clear entry with each bay subdivided by six bow dividers to allow for dedicated presentation of stock.